The state Department of Health now is advising Big Island residents to wash produce thoroughly to help prevent exposure to pesticides, bacteria, and parasites such as angiostrongylus, or rat lung worm, which has sickened at least six people. The DOH reports it has identified one-half dozen probable cases of illness caused by angiostongylus in 2008, including two that have resulted in comas. The cases are centered in and around the Puna district and have been traced to eating fresh raw vegetables from backyard gardens. A USDA report in 2007 found the culprit – a semi-slug known as Parmarion martensi – across the eastern part of the Big Island and Kailua-Kona. More than 3/4 were infected with the rat lung worm parasite. The Angiostrongylus cantonensis parasite can cause a rare form of meningitis called eosinophilic meningitis or angiostrongyliasis. The condition is also referred to as “rat lung worm” because rats are part of the life cycle of the parasite. 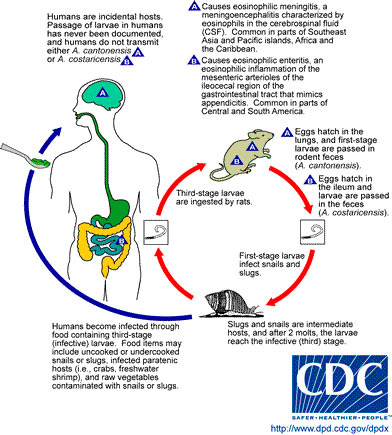 The parasite is found in snails, slugs, and freshwater prawns, crabs fish, and possibly the flatworm in Hawaii. Eating uncooked snails, slugs, freshwater prawns and fish can cause the rare infection, which can lead to serious illness. “It’s important to always wash raw vegetables and fruits thoroughly before eating them to remove insects, parasites, bacteria and other possibly harmful contaminants,” said Dr. Sarah Park, DOH State Epidemiologist and Chief of the Disease Outbreak Control Division. Signs of rat lung worm disease, which can affect the brain and spinal cord as the larvae travel through those tissues, can include severe headaches, nausea, vomiting, neck stiffness, and back, tingling skin, and hallucinations. Some infected people don’t have exhibit symptoms, or experience mild symptoms for a short time. Most patients recover without treatment, however anyone who believes they may be suffering from angiostrongyliasis is urged to seek medical attention. * Do not eat raw or undercooked snails or slugs. Handle snails or slugs while wearing gloves and wash hands thoroughly. * Do not eat raw foods contaminated with snails or slugs. Boil snails, prawns, fish, and crabs for at least 3-5 minutes. * Keep home gardens free of rodents, snails and slugs. The same type of semi-slug was first discovered on Oahu in 1996. The study’s authors, including Hilo-based research biologist Robert G. Hollingsworth, found 77.5 percent of semi-slugs collected at survey sites were infected with A. cantonensis, compared to 24.3 percent for Cuban slugs sampled from the same areas. The probability that semi-slugs will transmit rat lung worm disease to humans may be higher than for other slug and snail species because a high percentage of semi-slugs are infected, and the habits of semi-slugs increase the chance of contact with humans, the researchers concluded. So, how do you wash vegetables to avoid rat lung worm? Someone suggested rinsing the vegetables first to rid the vegetable of any slugs, then soak the veggies in water that has Hawaiian salt in it, then dry. Does that sound OK? Finally I heard you should wash all raw by soaking for a while in vinegar, then rinse with water, then soak again and wash again. A drop of iodine can’t hurt in the water or vinegar. Also a water filter is not enough to purify catchment water of these angiostongylus . It should be boiled. If you know people complaining of lots of headaches and bone aches, it could be this parasite. Wish there was a pill to kill. There are some herbal formulas but no proof they work. one is called PARA Response with Wormwood and cloves and more.